Tenkar's Tavern: Its Here! 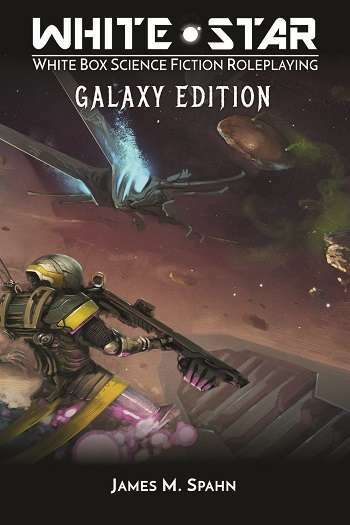 White Star: Galaxy Edition in PDF has Released! Its Here! White Star: Galaxy Edition in PDF has Released! The update many of us have been waiting for is here - White Star: Galaxy Edition has arrived. You've read White Star I hope (PWYW) . Well, this is all that and more. White Star is my go to OSR sci-fi ruleset and as it's built off of Swords & Wizardry White Box, you already know much of the rules ;) The White Star: Galaxy Edition is $9.99 in PDF - hardcover is coming soon. Ace Pilots, dead-eyed Gunslingers, and irrepressible Star Squirrels blast off across the stars to save the galaxy from the horrors of the Void! Hellfire Mecha march across the battlefield, leaving carnage in their wake! From the galactic center of Omega Consor to the Manrash System on the edge of the universe, the galaxy needs heroes! Endless galactic adventure awaits you in White Star: Galaxy Edition! Integrated and updated to include material from White Star and the White Star Companion, White Star: Galaxy Edition integrates new rules, new options, and expands the original game. Now more than just a tool box, White Star: Galaxy Edition offers you a universe full of thrilling adventure! Complete rules for Starship, Vehicle, and Mecha combat! New Starship and Vehicle Modifications! New Equipment, Advanced Technology, and Cybernetics! Two new forms of Mysticism: The tribal Etchings of the Yabnab and strange Chitterings of the Star Squirrels! New Optional Rules, like Deeds Dark & Daring, to add pulp sci-fi heroics to your game! New Star Systems: The rugged Marnash Sector and strange Scuiridae System! White Star: Galaxy Edition is compatible with all previous White Star products and can be seemlessly integrated into White Box and other OSR material! Had to grab it as soon as I saw it had been released. Definitely awesome stuff. Anyone know the best way to contact the author if I have questions regarding the new edition? In addition to typos/phrasing issues I have a rule question or two. Don't get me wrong, I'm enjoying what I'm reading, but this seems like an advanced beta version more than a finished product. There's an errata thread over at google plus. You can report anything you find there, link below. It should look less beta after we all help to polish it up.